REFLECT What is a campus green fund? REFLECT If you are a student, what skill sets and opportunities do you wish to gain from joining a campus program? If you are staff/faculty, what skill sets and opportunities do you want for your students? Share the possible benefits of a campus green fund. 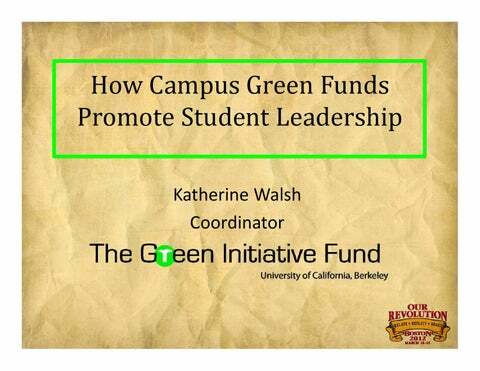 OBJECTIVE To prove campus green funds’ abilities in providing students with leadership and job opportunities while simultaneously improving campus sustainability and community. RELATE What are some skills you have developed from currently or previously held jobs? 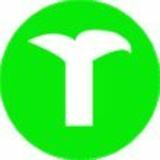 Do “green jobs” create skills and opportunities that are unique from those created by other jobs? If yes, name some. If no, why? REACT How can green funds do more for the campus community and public? DIVERSITY	&	SOCIAL	JUSTICE • Need more diversity in our project themes and applicant pool. – No faculty led projects. – Student applicants tend to be studying science or involved with environmental clubs. • TGIF needs to do more to connect projects to social justice – Currently, there are no environmental justice projects. – Beyond UC Berkeley, who/what will these projects impact? – What moral obligations do we have to the campus community and public (Cities of Berkeley, Oakland)? RELATE What actions can you take to implement a green fund program or improve an existing one? REACT‐ WICKED	AWESOME	IDEAS How will what you have learned during this session contribute to your personal development, professional development, or both? As a result of your attendance at this educational session, what question(s) do you have that are important for the profession to further examine? Please identify one wicked awesome idea that you will take with you and try to implement immediately in your jobs or further discuss with colleagues at your institution. And yes, we really do say ‘wicked’! WWPRD What Would Paul Revere Do?